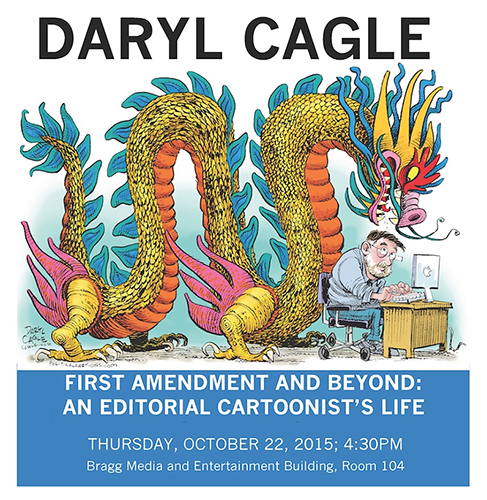 Heads up for any readers in central Tennessee: tomorrow afternoon in Murfreesboro, editorial cartoonist Daryl Cagle will present a free public lecture titled “First Amendment and Beyond: An Editorial Cartoonist’s Life.” Cagle’s talk–accompanied, he says, by “lots of cartoons”–will begin at 4:30 p.m. in room 104 of Middle Tennessee State University’s Bragg Media and Entertainment Building. Cagle’s lecture is jointly sponsored by MTSU’s John Seigenthaler Chair of Excellence in First Amendment Studies, the Communications Studies Student Club, MTSU University Honors College, and the College of Media and Entertainment. The event is free and open to the public; campus visitors are asked to print off a free temporary parking permit. Parking details can be accessed from MTSU’s news release.